Extra long post! My personal TV Highlights of 2014, which isn’t really a best/worst list (or maybe it should be) and, as noted last year, it doesn’t help that I’ve really cut back on tv viewing (shocking, I know), I don’t have Showtime, HBO, or even Cinemax (so, no “Homeland,” “Game of Thrones,” “Veep,” “True Detective,” or “The Knick”), and I have not pursued the streaming trend (so, still no “House of Cards,” “Orange is the New Black,” or “Alpha House,” which I’d still really like to check out, since it’s the Garry Trudeau project inspired by the trivia that a bunch of real US Senators and Congressmen were roommates). And I’m not still on the Downton Abbey bandwagon (still shocking), and I didn’t get to try FX’s “Fargo” either (I kind of wanted to do so, just to see Martin Freeman in a non-British role). 1. “How I Met Your Mother” (CBS) – series finale. A bittersweet farewell. Guess the journey was far more fun than the outcome (speaking as someone who got off the bandwagon a long time ago, only because of lack of time and my tendency to step away from a show when it reaches mass popularity). 2. “The Tonight Show with Jimmy Fallon” (NBC) – nice job, Jimmy! I can forgive Jay Leno (some might say he doesn’t need forgiveness, but the way things did not work out with Conan O’Brien was still surreal to me), but Jimmy Fallon and the Roots make the show fun again for me to watch once in awhile, rather than to avoid. 3. Winter Olympics 2014 (NBC). Probably the ultimate strange reality show (except that there were some far worse stuff, so oh well). Between the pre-Olympic games controversies (not all of which were on display on tv, rather than the print media and Internet), the error with the snowflake during the Opening Ceremonies, Bob Costas’ terrible infection of the eyes, and of course the thrills of victory and agonies of defeat (apologies to Jim McKay and ABC’s old Wide World of Sports for borrowing the phrase) – still amazing tv (and notwithstanding time zones and tape delays). Oh, and international political intrigue and violence (yeah, can’t really forget that). 4. “Dancing With the Stars” (ABC). Hmm, I will hand it to ABC for making things strangely fun (in that “Well, I get some eye candy and entertainment; whatever” way). 2014 was very watchable for Dancing With the Stars with ringers such as Charlie White and Meryl Davis (the Olympic ice dancing champions) and at the end of this year, Alfonso Ribeiro (never give up the Carlton!). Some people were the kind who I didn’t think of as “stars” (not when the pro dancer is more famous than the “star”). Oh, and so inspiring to see Paralympic snowboarder Amy Purdy go as far as she did. Derek Hough, the pro dancer, was ridiculously talented in choreography and dancing, I have to say, and Val Chmerkovskiy, the third place pro dancer this most recent fall season – so hot. 5. “Masterpiece Theatre” (PBS) – no, I’m still not on the “Downton Abbey” bandwagon (gasp!). 2014 had a lot of great stuff – the return of “Sherlock” (from BBC, with Benedict Cumberbatch and Martin Freeman as Sherlock Holmes and John Watson); the return of Detective Constable Morse in “Endeavour” (complete with an odd cliffhanger); “Inspector Lewis” (with Lewis’ partner Hathaway practically becoming the 21st century Morse, in the brooding and honorable way); the final run of actor David Suchet as Hercule Poirot (with the final episode on streaming online tv, which pissed me off because I wasn’t paying for that, as cheap as I am, and I didn’t get to see it because PBS didn’t air it); and “Death Comes to Pemberley” (actor Matthew Rhys got pretty intense as Darcy and the two-parter was mostly entertaining). 6. Comic adaptations to tv – I ultimately have mixed feelings on “Gotham” (FOX) (other than Jada Pinkett Smith’s Fish Mooney, I’m not sure what to make of the women on this show, and I’m behind on episodes as it is). “The Flash” (CW) had the most fun series premiere, I have to say. I didn’t catch “Constantine” (NBC). “Arrow” (CW) looks as strong as ever (although I’m not much of a viewer and I’m not even on the Arrow bandwagon). 7. Following up on “Sherlock” above, I will say that I’m still a viewer of “Elementary” (CBS) (Jonny Lee Miller and Lucy Liu as Sherlock Holmes and Joan Watson). I wish that show does a better job being an ensemble show (I like the moments of Detective Bell (Jon Michael Hill), and for God’s sake, CBS, you have Aidan Quinn as Captain Gregson!). Still: it’s a watchable show. 8. “Gracepoint” (FOX). I will credit FOX for trying to redo BBC America’s “Broadchurch” (back in the UK, “Broadchurch” was from ITV). It was weird to see actor David Tennant as Detective Emmett Carver (who seemed to still be Inspector Alec Hardy but with a bland American accent), in California (but filmed in the area of Vancouver; I thought the show wanted to be northern California). And, Anna Gunn wasn’t quite Olivia Coleman was as the woman cop, Ellie Miller. The changes from the “Broadchuch” could have been a little more and the writing seemed a little weak, but otherwise strong acting. If you hadn’t seen “Broadchuch,” you’d think that “Gracepoint” was better than average tv (and I’d say that it was), but if you saw “Broadchurch,” you know this could have been better (which itself wasn’t great as a British mystery series (I have seen better), but was so intense at the end). 9. Colbert Report / The Daily Show with Jon Stewart (Comedy Central) – farewell to Stephen Colbert! What a weird and sweet way to end! (well, the end of “Stephen Colbert,” the conservative blowhard character; I look forward to see how Colbert the real person takes over for David Letterman). Jon Stewart was great this year, in piercing the silliness of everyone out there (sometimes even himself). 11. “Cosmos” (FOX/National Geographic) – Neil de Grasse Tyson and Seth McFarland joined forces to bring science to network tv! On FOX, of all networks! (I’m still not sure how FOX News, as a bizarre force of bizarreness – not that my politics should be that obvious – would be somehow related to the entertainment side of FOX (where FX and regular FOX keep making entertainment that might not fit “family values” and, oh, wow – science!). 12. Ken Burns’ “The Roosevelts: An Intimate History” (PBS) – fascinating review of the lives of Theodore, Eleanor, and Franklin. I thought that I couldn’t learn more about them, having read or studied a lot about the Roosevelts, but Burns’ storytelling was engrossing. 13. “Doctor Who” (BBC/BBC America) – Series 8 – with Peter Capaldi as the Doctor (the 12th one, putting aside any quibbles about the numbering of the Doctors) and Jenna Coleman as Clara, the companion. What a great season, despite the plot holes (and sometimes due to them). The Christmas special of 2014 kind of made up for the sadness of the final two episodes – dreams within dreams, and in the end, all you want is to make things up with your friends (or at least, the Doctor and Clara were owed a better Christmas than last year’s, putting aside that the Doctor got a whole bunch of more lives to live; they had a rough time with their crazy adventures this year). The Christmas special of 2014 was memorable for the appearance of Santa Claus, a.k.a. Father Christmas, being played by Nick Frost (whose appearance was a lot more heartwarming than Simon Pegg‘s appearance back during the era of the 9th Doctor (Christopher Eccleston) (Pegg was villain-like for that episode; but, hey, if you want to watch Frost and Pegg together again, feel free to watch Shaun of the Dead and Hot Fuzz). 14. “The Late Late Show with Craig Ferguson” (CBS) – I’ve been terribly inconsistent about watching Craig, but I made sure to watch his last episode, which had a nice opening song with all his past guests (so he and Stephen Colbert had similar ideas on that for their shows) and closing with a dream sequence, which brought back Drew Carey and Craig’s character Mr. Wick (from Carey’s old sitcom). I wasn’t sure what to make of Craig’s having Jay Leno as the final guest, but I suppose Craig wanted to end with a forgiving note (well, not from Craig, anyway, but again, from me and an audience who weren’t sure about that O’Brien and Tonight Show mess) and an homage to the traditional late night tv format (which Craig had long made fun of, with the robot sidekick and puppets). 15. “Community” (NBC) – season 5 was funny and odd, but bittersweet too (farewell to the character of Troy (Donald Glover); and what on earth will Greendale Community College do the next season on Yahoo?). “Vicious” (PBS) – this British sitcom import, with Derek Jacobi and Ian McKellen, was biting. “Selfie” (ABC) – well, it was not successful, but it tried to do well with John Cho as a romantic comedy lead; that title never did the show any favors. Nonetheless, I think ABC’s diversity experiment should continue. Anthony Bourdain’s “Parts Unknown” (CNN); “The Walking Dead” (AMC); Key & Peele (Comedy Central); Chris Hardwick’s “@midnight” (Comedy Central); “Last Week Tonight with John Oliver” (HBO) (well, it was terrific from what I was able to watch on YouTube). I fell behind on “The Americans” (FX); “Suits” (USA); “Justified” (FX); and so much more stuff, so that I can’t speak about them. I’m almost embarrassed about how I’m so behind (ok, make that very embarrassed, but it can’t be helped). I didn’t get to watch NBC’s “Peter Pan,”the live musical special, but from the anecdotal evidence that I saw on Facebook (not the most accurate source of information, of course), people had a campy good time (having flamboyant pirates and Christopher Walken as Capt. Hook would cause that reaction). NBC had lower ratings than the previous year’s musical experiment (it’s hard to beat the nation’s love for “Sound of Music”), but they should still keep trying, since at least this is a unique thing that gets us thinking about NBC (in ways that, say, the Olympics and “The Blacklist” do not do, even though they’ve done a lot of good for NBC). I’m probably forgetting other notable stuff of 2014, but I never promise to be comprehensive! A Merry Christmas from triscribe. 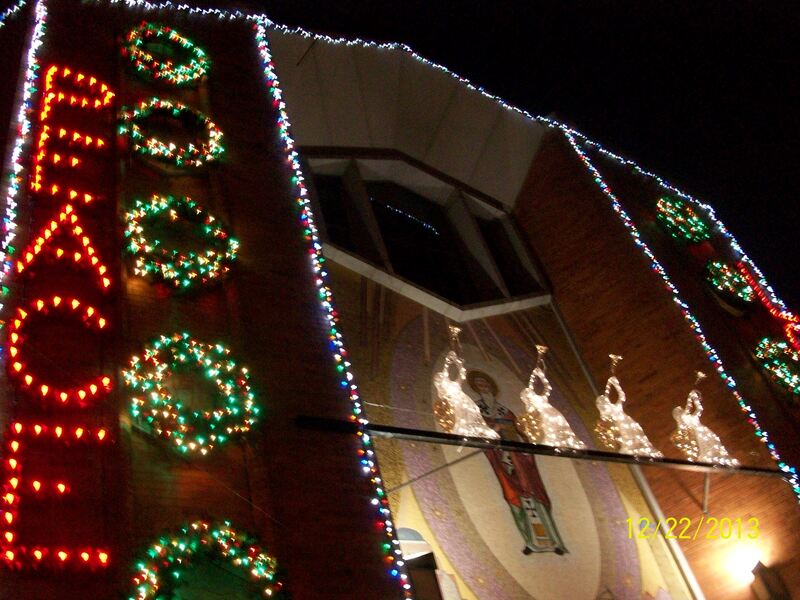 A photo of St. Athanasius Church, Bensonhurst, Brooklyn, 2013. This year, the church is again decked out like this. It really got me in the Christmas mood, I have to say. Gothamist posted and shared someone’s video of this year’s Dyker Heights Christmas get up. I have yet to trek out to Dyker Heights for Christmas and haven’t done that in years. They really go all out; clearly the homeowners there do not worry about their electricity bills. A list of links to triscribe blog posts from Christmas past: Christmas 2013, Christmas Eve 2012, Christmas 2011 (with Frosty and a reindeer), Christmas 2010, (with an extra one from December 2010), and Christmas 2009 – which has links to the other posts of Christmases past. Or, you know, you could check the archives. Peace on earth and goodwill toward all people! Merry Christmas, everybody! Author ssw15Posted on December 25, 2014 December 25, 2014 Categories Brooklyn, LinksLeave a comment on Merry Christmas 2014! As longtime triscribers might know, I’m a Trekkie. I don’t go to conventions and, contrary to popular belief, I do NOT own a Starfleet uniform; but I watched a lot of Star Trek, and the movies, and read a bunch of the books, read a bunch of fanfiction, and even got real close to getting published in properly licensed Star Trek fiction (I mean, close). Part of me wonders if Star Trek should return to its roots – be a television show again and explore all kinds of storylines in an ensemble way again – maybe even in better ways than Star Trek had a chance to do before, considering the current advances in storytelling and the increased focus on diverse casting (which Star Trek had long been a pioneer in the first place). There came a point when Star Trek was the height of late 1980’s/1990s science fiction (yes, I know, there are fans of Babylon 5 who would say that that series took up the imagination of 1990s science fiction tv, but I wasn’t much of a B5 viewer). The optimism of Star Trek remains the source and inspiration of hope (and of our technology; iPads owe a lot to the devices that the TNG and DS9 crews used). It was something that defied the broadcast networks, dominating the wild and weird world of syndicated tv series (well, then came Hercules and Xena, Warrior Princess, but hey, those series gave us actors Kevin Sorbo and Lucy Lawless, so give them some credit). Plus, Star Trek: Deep Space Nine was a series ahead of its time – with its serialization of stories, the wartime storyline of a democratic society facing its values in a candid way, the dramatic protagonist (who just happened to be a person of color), and the way conflict among the cast was addressed and progressed (Major Kira and the Cardassians; the rebellion of the Maquis, whose storyline really floundered when the war storyline hit maximum drive). And, how DS9 expanded how dark the ideas of Star Trek could go, when humanity reached a lot of its optimism and still explore out there – DS9 didn’t get enough credit for what it did. Then, Paramount became a network and tried to use ST: Voyager and ST: Enterprise for better or worse. I stuck around. I could refer you to AV Club’s Beginner’s Guide to the Franchise as a decent start, if you’re not familiar with the ST franchise. Here’s my list from 2009 on my personal favorite Star Trek moments/episodes (putting aside that I recently looked up the clip of that lovely Captain Picard Day scene, when the kids of the Enterprise entered their drawings and sculptures to honor their role model, Captain Picard, to the amused delight of Riker and Troi). Then came the reboot, which somehow revived Kirk and the gang, without making me worry that the old ST universe could no longer be treasured. Some might complain that the movies (the original six and the two J.J. Abrams-verse reboot movies) were too much the “Kirk and Spock Show” (putting aside that the original television series was very much a Kirk, Spock, and McCoy show – the Big Three! – with the original six movies giving us the favorite supporting characters of Scotty, Sulu, Uhura, and Chekov). And, the Star Trek: The Next Generation movies were exceedingly the “Picard and Data Show” (no, really, it did hit some levels of ludicrousness, and I say that despite my fondness for Action Hero Captain Picard). But, if there was a way to figure out contemporary issues, how different people can get along (or not), and how a crew becomes a family (something Picard took way too long to figure out, I think) – well, I think our times need such a show on tv! Star Trek could ideally return to tv bigger, better, and more refined than ever (or so focused in a world of niche tv). And, really, an Abrams-style Star Trek tv series could be great – all of reboot Kirk’s issues could be properly expanded and considered, as would Spock’s (and really, so many of Abrams’ characters – tv and movie – have daddy issues). And, we need a chance to really get at McCoy’s issues on tv (the bad marriage; the “I’m not that bad a dad”; the Southern charm; the good and compassionate doctor; the dogged scientist; the bad astronaut; the not-great Starfleet officer – who got to stick around long enough to be an admiral meeting android Data). As a sidenote: well, I like to think McCoy wasn’t a terrible father, besides his “I’m going to space to get away from my ex-wife” bit, but the intended episode about his relationship with his teenage daughter never made it to tv, since the space hippie episode became about Chekov’s ex-girlfriend instead. But, McCoy is clearly a remarkable tv character; the big screen still hasn’t figured him out. And, the ensemble would have have a better shot at evolving on tv – Uhura as the great science fiction tv heroine, at last? Hmm! It was made for Abrams-style tv! (or… Whedon-style tragedy? I don’t know; let’s not go there; I’ll refer people to “Firefly” and “Serenity” and leave it at that). For me, the only question would be what network would take a chance to bring Star Trek back to television? I’d posit that BBC America would be the right place (it’s where reruns of Star Trek: The Next Generation are on), since it seems to be a nice place for a cast of characters and stories, and it doesn’t treat science fiction in a silly way (like a lot of Syfy series seem to be), with the provision of a devoted but niche audience. It turns out that I’m not the only one wondering if Star Trek should come back to television: like this item over at the Atlantic by Dave Sims. And, of course, Star Trek’s 50th anniversary is coming in 2016. I’d like to think that the anniversary could be something big and celebratory, hitting highlights while keep on trekking to the future (like how I really enjoyed that Doctor Who 50th anniversary episode). But, to do something big, Star Trek is either going to have to be back on tv or the big screen. And, I’m not quite sure how great the big screen effort might be, because I never quite feel enough room for philosophizing and character development with action (the usual blow ’em up stuff) in a movie (again, see above – the Kirk and Spock Show, Action Hero Captain Picard). The drive for Star Trek 3 (J.J. Abrams-verse reboot) is turning out to be a a bumpy one though. Changing directors, who knows what the script will be, and oh yeah, Star Wars (which shouldn’t be a factor, but it is, because J.J. Abrams is helming Star Wars; I like both ST and Star Wars, but ST took up years of my life because it was tv). Then, I gasped: for real, Justin Lin to direct the third movie?! I thought Justin Lin’s “Fast and Furious” movies reached tv-levels of storyline craziness (in a good way, that is). I’d be very curious to see what Lin could do for Star Trek, especially if the 3rd movie is done by Star Trek’s 50th anniversary in 2016 – honoring the tv legacy but pushing the boundaries. It might even be good (not going to say great; I could be way too premature here). Plus, hey, maybe Lin would give John Cho (reboot Sulu) some meaty stuff for the movie (as Angry Asian Man noted, they worked in Lin’s “Better Luck Tomorrow”). More importantly for this discussion, his last two Fast and Furious films were incredibly successful in terms of giving each member of the very large cast a chance to shine in terms of both character and action. If you’re someone who thinks the last two Star Trek films have been somewhat dominated by Kirk and Spock (beyond the extent that Star Trek has often been the Kick/Spock show), then this hire should be welcome news. At the very least, I have to imagine that Better Luck Tomorrow co-star John Cho will get a bit more to do this time around. Also of note, the Fast & Furious franchise’s head-first dive into sentimentality will actually fit right in with the Trek universe. Say what you will about the “drink every time Vin Diesel says “family” game for Fast & Furious 6, but Fast Five was not just a terrific action picture but a pretty great movie, period, and this is coming from someone who didn’t care much for the previous four films. It was a fifth sequel that used its complex continuity to its emotional advantage, and I might on a given day argue that it’s an even better “franchise all-stars to the rescue” movie than The Avengers. When I first saw Fast Five I was so into the narrative that when Vin Diesel makes his climactic suicide play, I actually bought the possibility of his death, especially since the culminating chapter felt and played like a terrific series finale to a long-running television series. I only remembered much later than the franchise’s skewed timeline would make such a sacrifice impossible. Anyway, point being, the surrogate family themes of the last three Fast & Furious films actually fit the Star Trek universe like a glove. We’ll see soon enough what kind of movie Justin Lin brings us for this Star Trek 3, but his experience on the Fast/Furious franchise, especially the superb Fast Five, has me more hopeful not less hopeful. No he’s not a geek favorite and no he’s not a die-hard Trekker, but frankly neither was Nicholas Meyer and he gave us two of the best Star Trek films around (23 years later, and I still well up at Kirk giving the course heading of ”Second star to the right… and straight on till morning”). I remain optimistic at the decision to give the man who made Fast & Furious into an A-level action franchise while actually upping the sentimentality can do the same for the ongoing Star Trek series. He is, to paraphrase the guy who I knew was never going to get the job but I would have loved have seen get the job, not the first choice. But he is the last choice, and (I hope) the best choice. My big tip to fellow Trekkies out there: keep hope alive, but don’t go overboard just yet. We’ll see what happens!